Background: Complementary and alternative medicine is a rapidly growing area of biomedical inquiry. Yoga has emerged in the forefront of holistic medical care due to its long history of linking physical, mental, and spiritual well-being. Research in yoga therapy (YT) has associated improved cardiovascular and quality of life (QoL) outcomes for the special needs of heart failure (HF) patients. 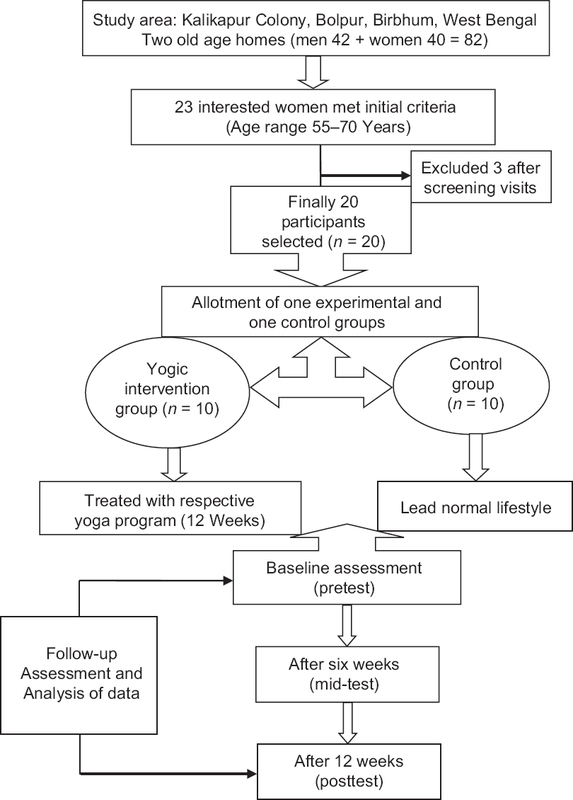 Aim: The aim of this study is to review yoga intervention studies on HF patients, discuss proposed mechanisms, and examine yoga's effect on physiological systems that have potential benefits for HF patients. Second, to recommend future research directions to find the most effective delivery methods of yoga to medically stable HF patients. Methods: The authors conducted a systematic review of the medical literature for RCTs involving HF patients as participants in yoga interventions and for studies utilizing mechanistic theories of stretch and new technologies. We examined physical intensity, mechanistic theories, and the use of the latest technologies. Conclusions: Based on the review, there is a need to further explore yoga mechanisms and research options for the delivery of YT. Software apps as exergames developed for use at home and community activity centers may minimize health disparities and increase QoL for HF patients. Background: There is very little evidence available on the effects of yoga-based breathing practices on response inhibition. The current study used stop-signal paradigm to assess the effects of yoga breathing with intermittent breath holding (YBH) on response inhibition among healthy volunteers. Materials and Methods: Thirty-six healthy volunteers (17 males + 19 females), with mean age of 20.31 ± 3.48 years from a university, were recruited in a within-subject repeated measures (RM) design. The recordings for stop signal task were performed on three different days for baseline, post-YBH, and post yogic breath awareness (YBA) sessions. Stop-signal reaction time (SSRT), mean reaction time to go stimuli (go RT), and the probability of responding on-stop signal trials (p [r/s]) were analyzed for 36 volunteers using RM analysis of variance. Results: SSRT reduced significantly in both YBH (218.33 ± 38.38) and YBA (213.15 ± 37.29) groups when compared to baseline (231.98 ± 29.54). No significant changes were observed in go RT and p (r/s). Further, the changes in SSRT were not significantly different among YBH and YBA groups. Conclusion: Both YBH and YBA groups were found to enhance response inhibition in the stop-signal paradigm. YBH could be further evaluated in clinical settings for conditions where response inhibition is altered. 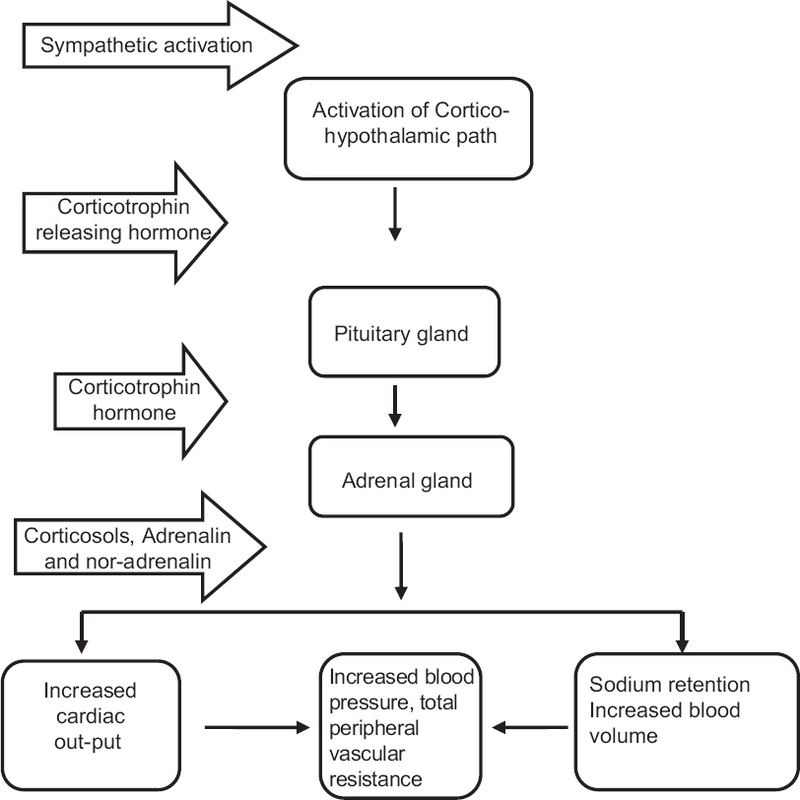 Background: The stressful condition may cause oxidative stress, which is responsible for various diseases. Aims: The present study was designed to find out whether yoga has impact on the reduction of oxidative stress. Methods: For the present study, 95 (n = 95) healthy male volunteers within the age group of 18–24 years were included, 35 (n = 35) volunteers were excluded. The remaining 60 (n = 60) volunteers were randomly divided into two groups: (a) Yoga Group (n = 30) and (b) Control Group (n = 30). Yoga training was given for 60 min per day, 6 days per week for 12 weeks in the yoga group, with no yoga training in control group. 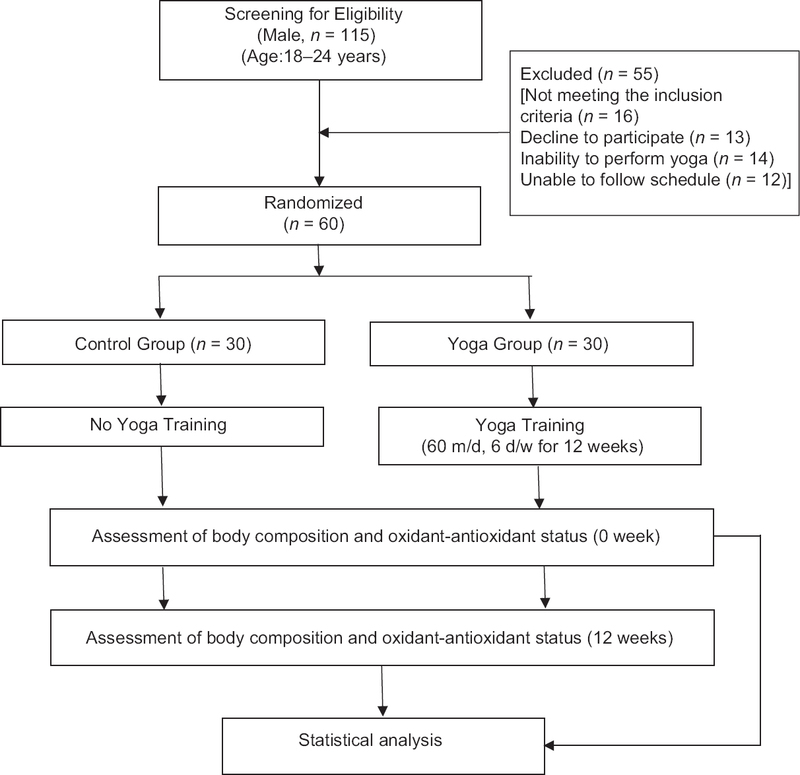 Assessment of body composition and oxidant-antioxidant status were performed in both the groups at baseline, before yoga training (0 week) and after (12 weeks) of the training. Results: Significant reduction (P < 0.001) in the percentage of body fat and malondialdehyde; significant elevation (P < 0.001) in superoxide dismutase, catalase, reduced glutathione and ascorbic acid levels were noted in the yoga group after 12 weeks when compared to baseline data (0 week). However, there was no significant difference in height, weight, body mass index, body surface area and lean body mass among the yoga group after 12 weeks when compared to baseline data. These changes might be due to yoga training. Conclusions: Regular yoga practice reduces body fat and oxidative stress. Yoga training may be helpful to reduce the chance of occurrence of various diseases and helps to maintain normal healthy lifestyle. Context: Attentional processes tend to be less well developed in the visually impaired, who require special training to develop them fully. Yogic breathing which alters the patterns of respiration has been shown to enhance attention skills. 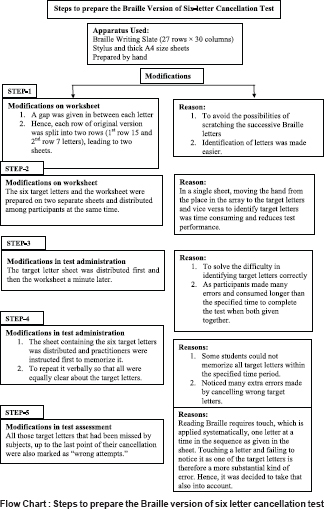 Letter cancellation tests are well-established tools to measure attention and attention span. Here, a modified Braille version of the six-letter cancellation test (SLCT) was used for students with visual impairment (VI). Aim: This study aimed to assess the immediate effects of Bhramari Pranayama (BhPr) and breath awareness (BA) on students with VI. Methods: This study was a self-as-control study held on 2 consecutive days, on 19 participants (8 males, 11 females), with a mean age of 15.89 ± 1.59 years, randomized into two groups. On the 1st day, Group 1 performed 10 min breath awareness and Group 2 performed Bhramari; on the 2nd day, practices were reversed. Assessments used a SLCT specially adapted for the visually impaired before and after each session. Results: The Braille letter cancellation test was successfully taken by 19 students. Scores significantly improved after both techniques for each student following practices on both days (P < 0.001). BhPr may have more effect on attention performance than BA as wrong scores significantly increased following BA (P < 0.05), but the increase in the score after Bhramari was not significant. 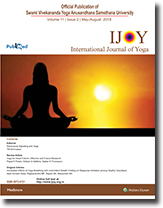 Conclusions: Despite the small sample size improvement in attentional processes by both yoga breathing techniques was robust. Attentional skills were definitely enhanced. Long-term practice should be studied. Background: Pelvic organ prolapse is the growing health issue related to women of the reproductive and postmenopausal age group in India and across the globe. Treatment option for pelvic organ prolapse includes both surgical and non-surgical intervention. The development of pelvic organ prolapse is an indication for major surgery among 20% of all women. Nevertheless, the recurrence of pelvic organ prolapse is detected among 58% of the patient after surgery. This highlights the need for preventive measures for reducing the impact of pelvic organ prolapse. Aims and Objective: To study the effect of 3 months yoga therapy in female patients suffering from mild pelvic organ prolapse. Material and Methods: 50 Participants were allocated into two groups (25 in each group) by generating Random allocation sequence. Women aged 20-60 with symptomatic mild pelvic organ prolapse in the yoga group were offered Mulabandha yoga therapy along with other conventional treatment modalities, while the control group was only on conventional treatment. All participants gave written informed consent. 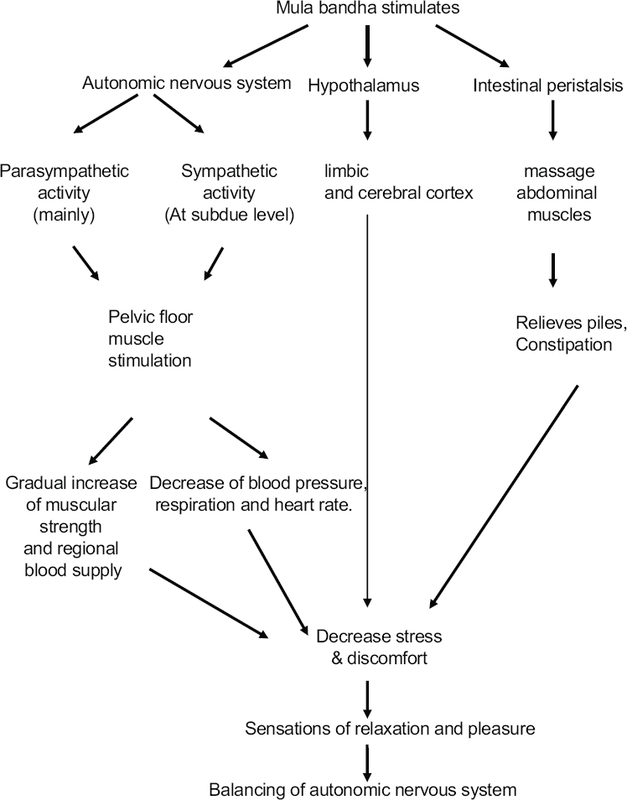 An assessment was done by improvement in chief complaints and Pelvic Floor Distress Inventory-20 (PFDI-20) & Pelvic floor impact Questionnaire-7 (PFIQ-7) at baseline and at the end of 4, 8 & 12 weeks. Results At the end of 12 weeks, Post-study comparison between the two groups showed a significant improvement in chief complaints like perennial pain, P/V discharge, Perineal muscle laxity and Feeling of something coming out P/V (P < 0.001). Participants in the yoga group improved by (on average) 5.7 (95% confidence interval 3.1 to 14.7) points more on the PFDI-20 than did participants in the control group (P = 0.1) and a mean score of PFIQ-7 was also improved significantly. Conclusions: Although Mulabandha (Root Lock) yoga therapy led to a significantly greater improvement in PFDI-20 & PFIQ-7 scores the difference between the groups was below the presumed level of clinical relevance (15 points). More studies are needed to identify factors related to the success of Mulabandha (Root Lock) yoga therapy and to investigate long-term effects. Purpose: This study aimed to investigate the effects of 12 weeks yogic intervention on blood sugar and lipid profile in elder women with Type 2 diabetes mellitus (T2DM). Subjects and Methods: Twenty elderly (age range 55–70 years) T2DM women were divided into two groups, namely, yogic intervention group (YIG: n = 10, age 64.70 ± 4.03, body mass index [BMI] 24.26 ± 3.40) and control group (CG: n = 10, age 64.40 ± 4.79, BMI 24.28 ± 2.36). YIG underwent yoga practice (Asanas, Kriyas, Pranayamas) for 12 weeks (3 sessions/week), while the CG continued their usual routine activities. Standing height, body weight, BMI, blood sugar, and lipid profile were measured before commencement and after 6 and 12 weeks of yogic intervention in both groups. Results: There was a significant (P < 0.01) decrease in fasting plasma glucose, postprandial blood sugar, total cholesterol, triglycerides, low-density lipoprotein, and very low density lipoprotein, with a significant (P < 0.01) increase in high-density lipoprotein level from its initial value in YIG, while showing insignificant result in CG. Conclusion: It can be said that yogic intervention may have the beneficial effects on blood sugar and lipid profile in elderly women with T2DM. Background: Polycystic ovarian syndrome (PCOS) is one of the commonest endocrine disorders in women, with a prevalence ranging from 2.2% to 26% in India. Patients with PCOS face challenges including irregular menstrual cycles, hirsutism, acne, acanthosis nigricans, obesity and infertility. 9.13% of South Indian adolescent girls are estimated to suffer from PCOS. The efficacy of Yoga & Naturopathy (Y&N) in the management of polycystic ovarian syndrome requires to be investigated. Aims: The aim of the present study is to observe the morphological changes in polycystic ovaries of patients following 12 weeks of Y&N intervention. Settings and Design: The study was conducted at the Government Yoga and Naturopathy Medical College and Hospital, Chennai, India. The study was a single blinded prospective, pre-post clinical trial. Methods and Material: Fifty PCOS patients of age between 18 and 35 years who satisfied the Rotterdam criteria were recruited for the study. According to their immediate participation in the study they were either allocated to the intervention group (n=25) or in the wait listed control group (n=25). The intervention group underwent Y&N therapy for 12 weeks. Change in polycystic ovarian morphology, anthropometric measurements and frequency of menstrual cycle were studied before and after the intervention. Results: Significant improvement was observed in the ovarian morphology (P<0.001) and the anthropometric measurements (P<0.001) between the two groups. Conclusions: The findings of the study indicate that Y&N interventions are efficient in bringing about beneficial changes in polycystic ovarian morphology. We speculate that a longer intervention might be required to regulate the frequency of menstrual cycle. Background: Physical activity is an integral part of one's daily life. Obese (Ob) and undernourished (UN) persons are known to underperform physically as compared to normal weight (N) individuals. 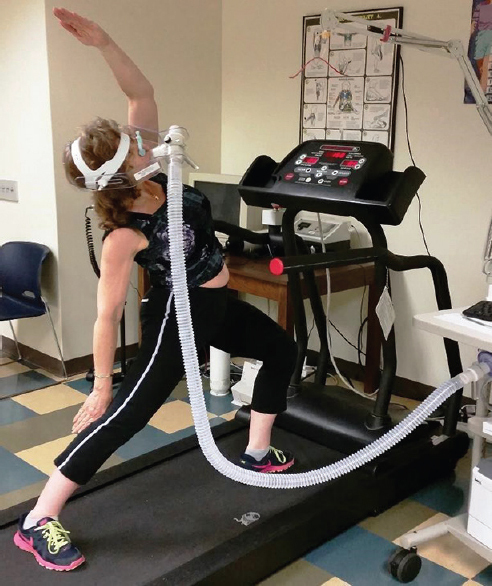 In this study, we have measured the energy spent to perform a prefixed exercise on treadmill walking and basal heart rate and blood pressure. Body mass index (BMI) and body fat of participating individuals were assessed. Fasting blood sugar and lipid profile were also evaluated. Materials and Methods: Eighty-three young individuals (male: 41; female: 42) of medical faculty, Universiti Sultan Zainal Abidin, who volunteered for the study, were recruited. The mean age of the individuals was 19.8 ± 0 years (P < 1.08). The individuals were grouped as N, UN/underweight, and overweight (Ow)/Ob based on BMI. Results: The results of the study revealed that there were no differences in the energy spent on performing the predetermined treadmill walking of 20 min duration among the three groups (a mean of 78 and 70 calories in all male and female subgroups, respectively). The distance covered by the males was 1.6 km while the females covered 1.4 km on treadmill walking in 20 min time. Basal blood pressure and heart rate and fasting blood sugar did not reveal any significant difference among the groups. However, total cholesterol and triglyceride levels were marginally higher in the Ow/Ob groups of male and female individuals as compared to other groups. Conclusion: Since the study individuals were very young and competitive by nature and possibly had no major metabolic disturbances, the differences in physical activity performances were not obvious. Possibly, such differences would become apparent only at later stages of life as age advances or when the intensity and duration of exercise are set at higher levels. Background: Mudras signify a gesture with hands, eyes, and the body. Different configurations of the joining of fingertips are also termed mudra and are used by yoga practitioners for energy manipulation and for therapeutic applications. Electrophotonic imaging (EPI) captures the coronal discharge around the fingers as a result of electron capture from the ten fingers. The coronal discharge around each fingertip is studied to understand the effect of mudra on EPI parameters. 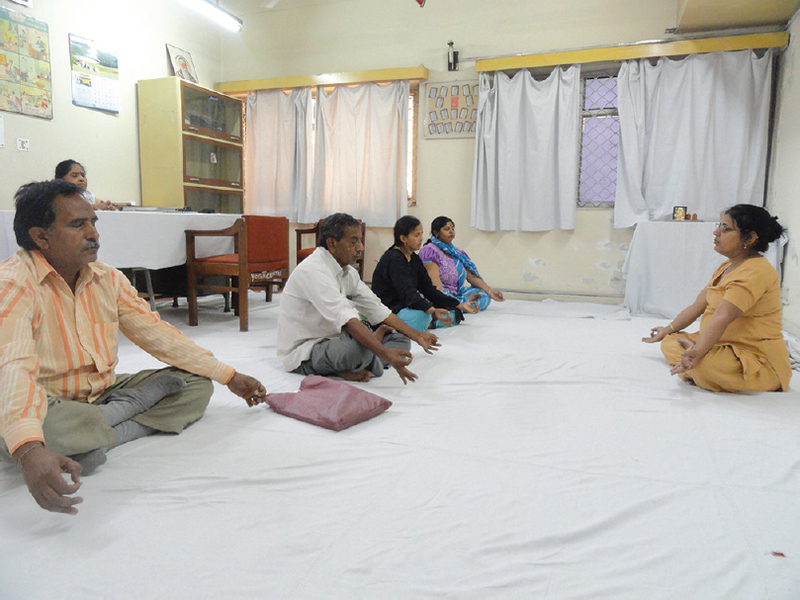 Methods: The participants were from Swami Vivekananda Yoga Anusandhana Samsthana and Sushrutha Ayurvedic Medical College, in Bengaluru, India. There were 29 volunteers in the mudra group and 32 in the control group. There were two designs: one was a pre-post design with control the other was pre-post with repeated measures with 18 individuals practicing mudra for 3 days. The duration of intervention for the pre-post design was 10 min on the 1st day, 15 min on the 2nd day, and 20 min on the 3rd day. A neural network classifier was used for classifying mudra and control samples. Results: The EPI parameters, normalized area and average intensity, passed the test of normality Shapiro–Wilk. The Cohen's d, effect size was 0.988 and 0.974 for the mudra and control groups, respectively. Neural network-based analysis showed the classification accuracy of the post-intervention samples for mudra and control varied from 85% to 100% while the classification accuracy varied from 55% to 70% for the pre-intervention samples. The result of the mudra intervention showed statistically significant changes in the mean values on the 3rd day compared to the 1st day. Conclusions: The effect size of the variations in mudra was more than that of the control group. Mudra practice of a longer duration showed statistically significant change in the EPI parameter, average intensity in comparison to the practice on the 1st day. Electro photonic imaging (EPI) is being researched relative to its application for yoga therapy. Three parameters of interest in EPI measurements are as follows: Communication energy (C), integral or normalized area (IA), and Entropy (E). It is important to note that C indicates the total energy of communication for the organ system; IA is an indication of total amount of energy that is available for the organ system while entropy is an indication of the amount of coherence of the energy. Coherence and entropy are inversely related; this means less the entropy, more the coherence and vice versa. Illustrative cases of successful therapy with yoga practices in a wide variety of abnormal conditions are examined, and in every case, entropy is shown to decrease for the affected organ system while communication energy stays within stable range. Relative to the electromagnetic (Rubik) and living matrix (Oschman) models, it is suggested that the regulation of energy, its coherence in the biological system and interaction with life processes provide the basis for model building and design of health-promoting procedures. Further, this approach is examined relative to yoga theory, traditional medicine systems, and scientific developments in the field of gene expression and neuroplasticity and a generalized model that we call Unified System of Medicine is proposed. This model has direct implications on methods used to control the environmental factors to get robust results from EPI application for therapeutic purposes. Implications for furthering research in yoga therapy using EPI and implications of EPI as a translational technology between traditional medicine systems and modern medicine is discussed. Aim of the Study: The aim of this study is to examine the effect of yoga treatment of eating disorders (EDs). 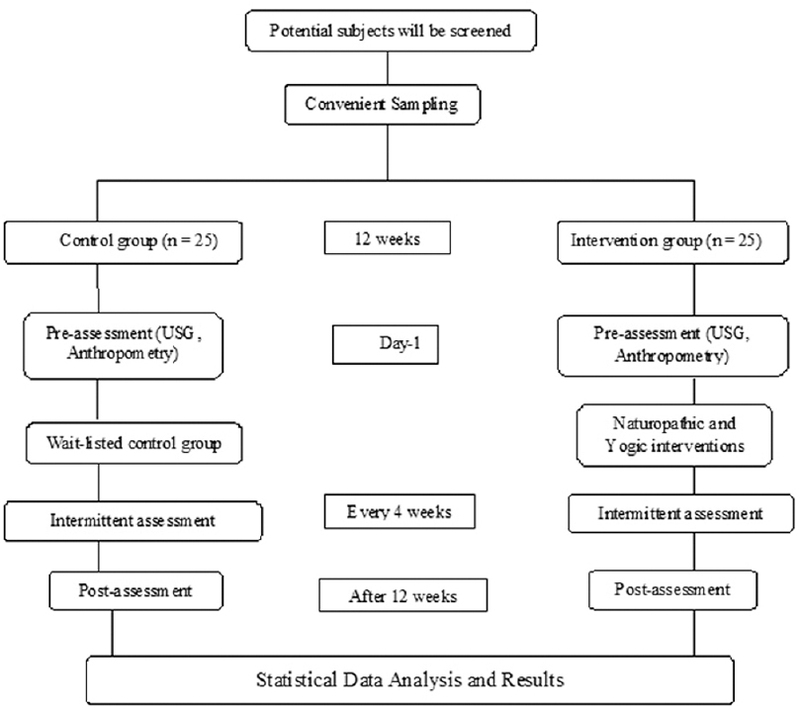 Methods: Adult females meeting the Diagnostic and Statistical Manual-IV criteria for bulimia nervosa or ED not otherwise specified (n = 30) were randomized to 11-week yoga intervention group (2 × 90 min/week) or a control group. Outcome measures, the Eating Disorder Examination (EDE)-Interview and Eating Disorders Inventory-2 (EDI-2) scores, were administered at baseline, posttest, and at 6-month follow-up. There was a dropout rate of 30% (posttest) and 37% (6-month follow-up). Results: The intervention group showed reductions in EDE global score (P < 0.01), the EDE subscale restraint (P < 0.05), and eating concern (P < 0.01) compared to the control group. The differences between the groups increased at 6-month follow-up. There were no differences between the groups in the EDI-2 score. 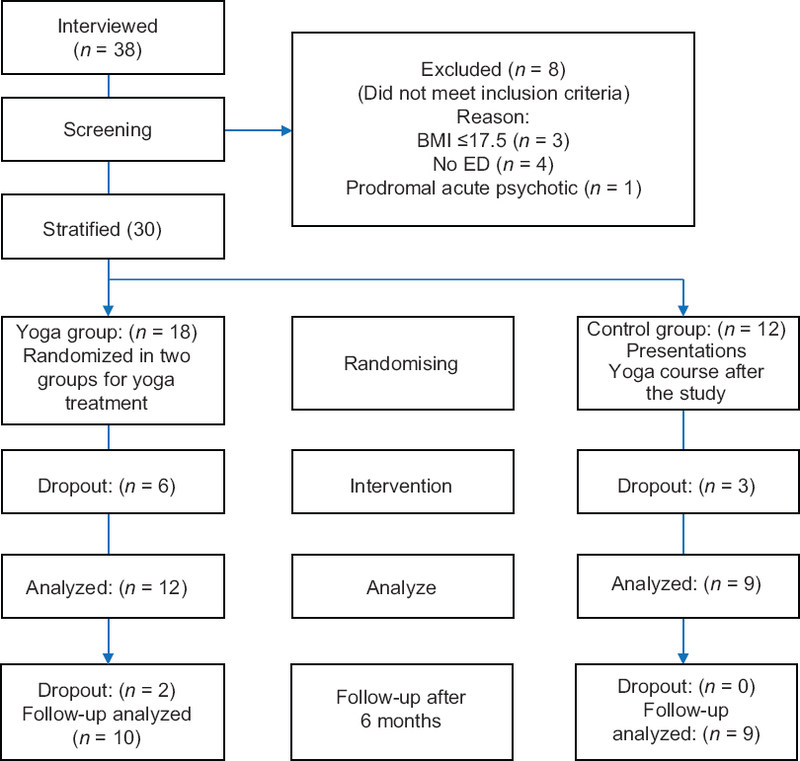 Conclusion: The results indicate that yoga could be effective in the treatment of ED. Introduction: Hypertension (HTN) is an important public health concern and a leading cause of morbidity and mortality worldwide. Yoga is a form of mind–body medicine shown to be effective in controlling blood pressure (BP) and reduces cardiac risk factors in HTN. Integrated approach of Yoga therapy (IAYT) is a residential yoga-based lifestyle intervention proven to be beneficial in several health conditions. Aim: To study the efficacy of 1 week of residential IAYT intervention on cardiovascular parameters in hypertensive patients. Methodology: Twenty hypertensive individuals (7 females) within age range between 30 and 60 years (average; 46.62 ± 9.9 years), who underwent 1 week of IAYT treatment for HTN, were compared with age- gender-matched non-IAYT group (5 females; average age; 47.08 ± 9.69 years) in terms of systolic BP (SBP), diastolic BP (DBP), mean arterial pressure (MAP), cardiac output (CO), stroke volume (SV), baroreflex sensitivity (BRS), and total peripheral vascular resistance (TPVR), IAYT program consisted of sessions of asanas, breathing practices, meditation and relaxation techniques, low salt, low-calorie diet, devotional session, and counseling. Individuals in non-IAYT group followed their normal routine. All the variables were assessed before and after one week. Data were analyzed using SPSS version 16. RM-ANOVA was applied to assess within group and between group changes after intervention. Results: There was a significant improvement in SBP (P = 0.004), DBP (P = 0.008), MAP (0.03), BRS (P < 0.001), and TPVR (P = 0.007) in IAYT, group whereas in control group, we did not find significant difference in any of the variables. Between-group comparison showed a significant improvement in SBP (P = 0.038), BRS (P = 0.034), and TPVR (P = 0.015) in IAYT group as compared to non-IAYT group. Conclusion: One-week IAYT intervention showed an improvement in baroreflex sensitivity, systolic BP, and total peripheral vascular resistance in hypertensive patients. However, further randomized control trials need to be performed to confirm the present findings.